Thanks to the concentration of people earning a high income, many of the services and products in New York City are cheaper than what you would find in many other parts of the country. The concentration of people earning good income leads to competition which keeps prices low. The one exception is housing and the high rent that NYC residents pay is a reminder that not everything in the city is cheap. Today, everyone who rents in NYC is paying on average more than almost anywhere else in the nation and it keeps getting more expensive. There are several reasons for this phenomenon and it is the combination of circumstances that keeps allows for high rent to be maintained. These are the basic reasons that New York City has become a more popular place to live over the past two decades. The crime rate has essentially been cut in half, this has led to an explosion of businesses offering more items and better services. And, that has led to more job opportunities in the city. However, these are not the only reasons why the high rent exists. Arguably the most basic reason is that housing simply has not kept up with demand. With the influx of new residents, there are simply not enough apartments, condos and homes that are available. The combination of being on an island and the tough building codes and regulations have made new housing construction difficult. The result is that there are simply more people looking for places to rent than places that are available. 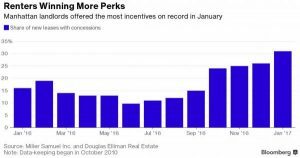 One interesting reason why rent has gone up is the strong increase in seasonal or occasional use homes, which has skyrocketed from less than 1 percent to nearly 2 percent. That may not seem like much at first, but it represents homes that are not being sold, but instead rented for seasonal or occasional use which has left fewer homes available for year-round rental. Despite the high rent, there are many who are still moving to NYC because of the concentration of attractive amenities such as the many restaurants, theaters, nightclubs, and bars that make it a great place to live. 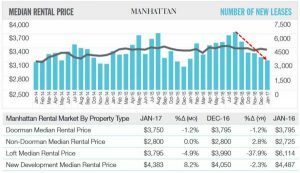 For those who earn a high-income, New York City is a very attractive place to live with little concern about the rental conditions. However, for those who do not earn a big salary, being close to the many amenities the city offers is no substitute for the price they must pay for renting. New York City is not alone when it comes to limited housing and rising rents as places like San Francisco are seeing the same conditions. The relatively high pay for many jobs has helped to alleviate some of the high rent issues in NYC, but not all of them. The struggle to get new housing built combined with fewer current spaces on the market means that rent will keep rising for the foreseeable future.